Description: Terra Australis. Early map showing the "Southern Continent" and Magellan Straits. Description: South Pole with German text below giving details of explorations. Coloured. Description: South Pole showing Terra Incognita. Original colour. Description: South Pole. Geographically based on Jansson's Heirs map but corrected. Coloured. Description: Southern Hemisphere. Map centring on the South Pole with Australia, Southern Africa and South America. Coloured. 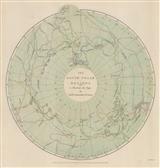 Description: South Pole showing the routes of Captain Cook and other explorers. Coloured. Description: Van Kerguelens Island. Chart of part of the island. Inset Prince Edwards Island. Coloured. 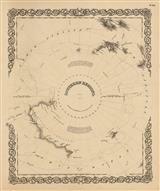 Description: A map of the South Pole, before the great age of exploration, when little of the continent was known. Original colour. 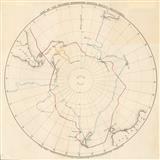 Description: Two maps on one sheet showing the route of the Challenger Expedition around the South Pole as well as detail on Macdonald and Heard Islands. Printed colour. 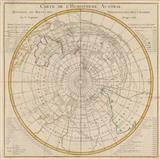 Description: Antarctica by the Scottish Geographical Society showing the supposed outline of the continent according to John Murray, as well as the limits of drift and pack ice, and the ocean depths. Printed colour. 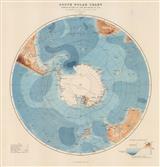 Description: Attractive map of the South Pole, both as fact and speculation published on the cusp of the Heroic Age. Printed colour. 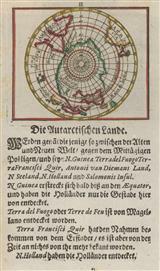 Description: Map showing the South Pole at the dawn of the Heroic Age with numerous insets in printed colour.